"The rise of UTsang-Pas is as much condemnable as the collective and open show of regionalism/provincialism from Khampas for a long time in exile." "Lobsang Sangay was a stronger candidate who can speak to what the public wants to hear while Penpa Tsering struggled to make a connection with the less-educated masses." "The laws that govern Tibetan elections must be re-written in its entirety. At times of the need to interpret rules, logic and reason must prevail." "Lobsang Sangay has the most loyal supporters while Penpa Tsering had the better campaign team." "Prof. Samdhong Rinpoche's boycott of the general election could send a wrong signal to the people of Tibet. Not casting a vote may not be the best choice for the vibrant growth of nascent Tibetan democracy." "Wechat is proving to be the China's greatest information gathering tool from exile Tibetans. Now, China need not have to look for information. Information comes to her at no cost." "One of the biggest disappointment is the total silence from the Private Office of His Holiness the Dalai Lama. This silence could be equivalent to the denial of the rights of Tibetan people to know the truth." "With the dirty, demeaning and dangerous election campaigns on social media network and ugly public discourses on Wechat, Tibetans in Tibet might be having a second thought on the values of having a democratic form of government." "Voting is just the first step. If your Sikyong candidate wins, you now have a bigger share of responsibility in the next 5 years to ensure he lives up to his promises as well as your expectations." "This election was all about finding a better and bigger reason to drag His Holiness the Dalai Lama's name and title to support his argument. Sadly, it's a wild race that shows no sign of stopping in the future." "The open endorsement from two sitting Kalons helped to uncover a disturbing case of existing elite power and culture in the CTA. 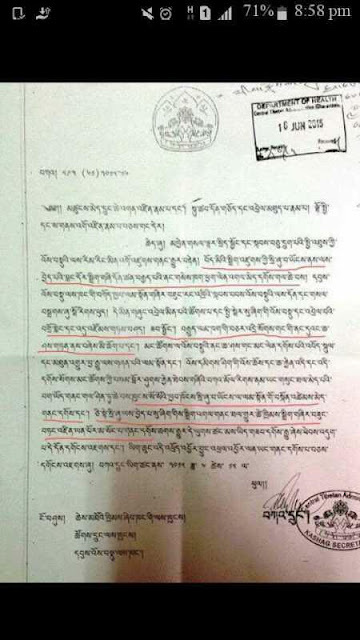 They themselves (Kashag) are the ones who instructed Tibetan officials around the globe to refrain from participating in any election related matters. Rule-makers cannot be Rule-breakers."